Hi, this script is no longer being actively maintained. It will remain listed until game updates cause it to break. 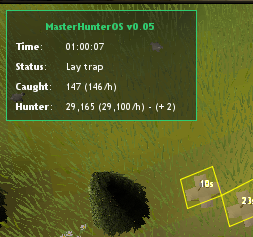 MasterHunterOS is in BETA stage, may contain bugs only tested at birds so far. Start (logged-in) at the hunting spot, the script hunt birds/chins depending on your level. Will use X trap formation if available. 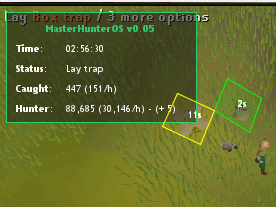 I'll be able to test chins once my account hits 53 hunter. Weird, it should check for it. I'll fix it tonight. Thank you so much for making this bot! I've been waiting for a hunter bot since day 1! No, these won't be added for now. There are still tons of improvements needed for the current supported traps. I'll add some failsafe when it missclicks to move the mouse. I'll need to add a failsafe for that. I've been having the same problem. It worked before but when you adjusted it sometimes gets stuck and stands in one spot trying to put down a trap. Now checks if other users trap is already on your tile.